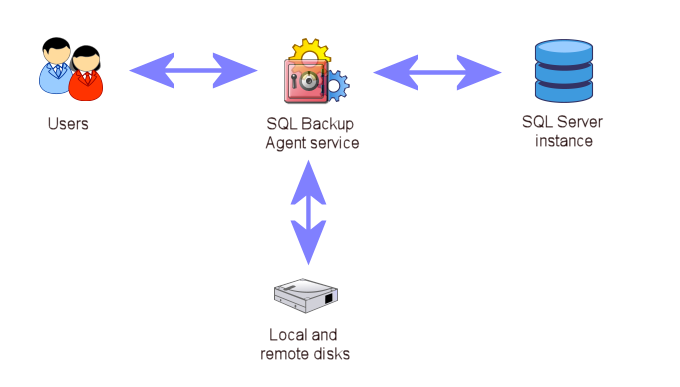 This document explains the rights required by users and the SQL Backup Agent service. Examples in this document refer to individual user accounts, but it is more convenient in large environment to manage permissions by user groups. 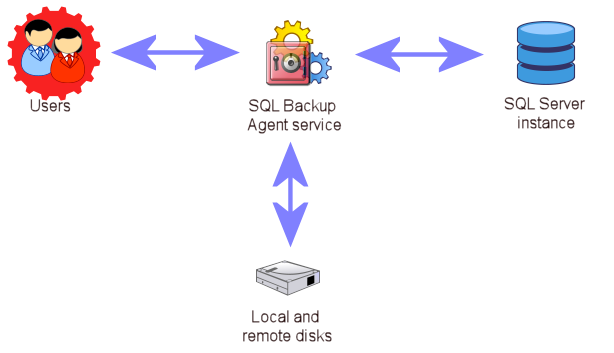 SQL Backup services are carried out by the SQL Backup Agent service. This is a Windows service that is installed when you install the SQL Backup server components. Users or jobs run SQL Backup commands using extended stored procedures. A list of SQL Backup extended stored procedures can be found here. SQL Backup then communicates with SQL Server using the SQL Server Virtual Device Interface (VDI). See this document for details of the interaction between SQL Backup and SQL Server. During backup and restore processes, all data transfers are handled by the SQL Backup Agent service. Users need rights to execute the relevant extended stored procedures. E.g. They also need to have rights to backup or restore the databases that they want to work with. E.g. 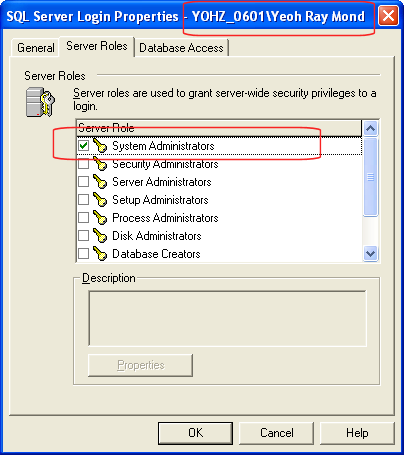 Note that users need not have the SQL Server sysadmin fixed server role. 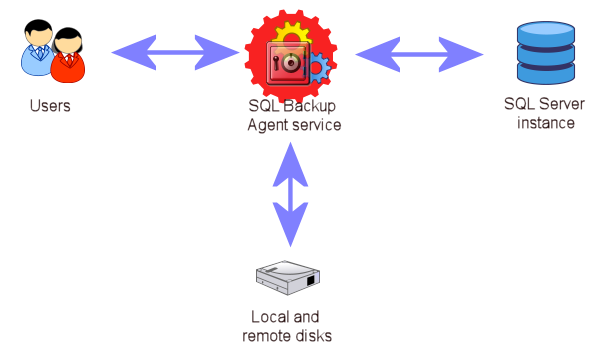 All rights related to the SQL Backup Agent service comes from the user account used to start up the service. This user account needs to have the 'Log On As A Service' right in order to be able to start the service. The service startup user needs to have the SQL Server sysadmin fixed server role. This is a requirement of the SQL Server VDI library. The service startup user also needs rights to the relevant network shares if backup files will be stored to/retrived from network shares. you should then check if the SQL Backup Agent service startup user has been denied access rights to the related SQL Server service. You can do this by using the sc command line utility. The sc utility can also be used to grant rights. You can download this utility (DACLReader) to check the current access control entries (ACEs) for a specific SQL Server service. See this document for details. The SQL Backup 5 GUI was designed such that the user using it needs to be a SQL Server sysadmin. The SQL Backup 4 GUI does not have this requirement, but does require the user to have rights to the extended stored procedures. If you use the command line interface (sqlbackupc.exe) to perform backups and restores, the user running the application needs to have the SQL Server sysadmin fixed server role. This is because the command line interface communicates directly with the VDI, and does not use the SQL Backup Agent service.